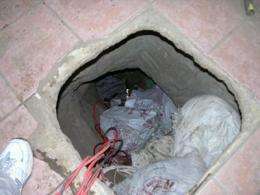 Criminals of all kinds are digging tunnels along the U.S. border at a fast and furious pace. Of every tunnel ever discovered by U.S. border patrol agents, 60 percent have been found in the last three years. Agents spot a new one every month. "All of them have been found by accident or human intelligence," said Ed Turner, a project manager with the U.S. Department of Homeland Security (DHS) Science and Technology Directorate (S&T). "None by technology." To battle these secret burrows in the 21st century, S&T thinks this will have to change. In partnership with Lockheed Martin, DHS S&T is pursuing a fresh approach that uses sophisticated ground penetrating radar. The Tunnel Detection Project is part of the Homeland Security Advanced Research Projects Agency (HSARPA), a distinct office within S&T set up to think out-of-the-box. HSARPA invests in concepts offering the potential for revolutionary changes in homeland security technologies. If successful, the tunnel detection technology will help agents locate and plug tunnels almost as fast as the criminals can dig them. While most tunnels are used to move drugs or people, they could also be used to move in weapons and explosives for a terrorist attack. Tunnels are a serious challenge for border patrol agents because they can begin and end almost anywhere; their entrances and exits are often hidden inside old warehouses or under trees; if old ones are discovered, new ones are quickly begun. Initially, S&T explored the possibility of an unmanned aircraft equipped with radar technology that would fly along the border searching for tunnels. While this concept remains a goal, Department scientists and agents realize that most of the existing tunnels run through large urban centers where they are difficult to spot from satellite imagery. In addition, the airborne radar's radio frequency signals pose privacy concerns if they cross into someone's home. The new design technology is to place the radar antennas in a trailer that will be towed by a Border Patrol truck. The antennas shoot a signal directly into the ground and use it to construct a multi-colored picture of the earth. Tunnels show up as red, yellow, and aquamarine dots against a blue background. Border patrols agents would see these images on a monitor mounted inside their truck. Ground penetrating radar is a promising technology because it is already used by civil engineers to reconstruct underground images. These engineers, however, are usually only interested in detecting cables or pipes that may be a few meters beneath the earth. S&T must find tunnels that often run much deeper. 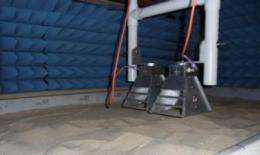 To find these, the radar uses much lower frequencies that penetrate the ground much better, and a sophisticated new imaging technology that can display clear pictures of deep tunnels. The Lockheed Martin team showed off an early scale model prototype this spring, mimicking the Southern U.S. border with large box filled with sand and rocks, and using pipes as tunnels. Next, they will send the technology to the Southwest this summer, where it will be tested against the rigors of the real life border. Separating tunnels from rocks, plants, and other objects along the ground or buried shallowly will be a key test. "We want to develop something that can be used with high reliability so you'll find tunnels and not other things in the ground," said Turner. Goodwill potential: Serial killers' caches. The drug dealers, the real ones, the big ones....are making enough money to buy one and test tunnel designs that might fool this type of device.